Giant Monsters Attacked Our World. We called them Kaiju. I don’t think I’m alone in saying that I simply did not give a toss about Pacific Rim (2013) when it came out. It all just looked and sounded… bad. Don’t get me wrong, I love giant robots stomping about the place as much as anyone, but the continued butchering of the Transformers franchise at the time left me feeling jaded and, frankly, sick to death of it all. That is, until I watched it. Directed by Guillermo del Toro, Pacific Rim was a masterclass in how to inject genuine humanity into a story that is primarily a big sandbox of robots versus big-nasty-monster-things. I think I’m right in saying that it took a lot of people by surprise, invoking the tropes of our collective childhood and delivering an exceptional film into the summer blockbuster slot of 2013. It’s no wonder, then, that we fast forward to 2018 and we have our extremely obvious sequel: Pacific Rim: Uprising (2018). With Del Toro releasing his grip on the franchise to tell a fish man love story, the reins were taken up by Steven S. DeKnight. Already receiving some damning criticism from my Twitter feed, I was fully prepared for the stupid, dumb, soulless story that supposedly leaked its lubricant all over the original for the sake of childish jokes and schlocky action. Set ten years after the events of the first film, Pacific Rim: Uprising introduces us to a world where humanity won. Well. Kinda. Having beaten off an invasion of giant alien monsters referred to as Kaiju with the use of equally giant – and extremely heavily armed – robots known as Jaegir; the world has finally had a chance to rebuild. Naturally, this has started with the larger, wealthier cities around the world and has, for the most part, ignored much of the suburbs and coastal areas. In these ghost towns, a community of wasters and low lives eek out our livings squatting in abandoned properties and, for the riskier groups, scavenging for the leftover scraps of the war that decimated much fo the world ten years prior. One of these lowlifes is our protagonist, Jake Pentecost (John Boyega), a young man on the run from the responsibilities he has been landed with after the death of Stacker Pentecost, his father who, essentially, saved the world and ended the war. With his knowledge of Jaegir and military protocols, Jake has earned a reputation with his peers as a thief and man-about-town. It’s not necessarily a good reputation. After a brief introduction, we see this for ourselves as Jake leads a group of criminals into the heart of a disabled Jaegir to recover a power core, to presumably sell to the highest bidder. Things quickly go sour when Jake discovers that someone has beaten them to the core – and is quickly making their escape. Jake tracks the trespasser to an abandoned factory, and discovers the identity of the trespasser is Amara Namani (Cailee Spaeny), a young woman orphaned by the events of the Kaiju invasion. In her workshop, Jake discovers that Amara has assembled her very own Jaegir out of scrap and spare parts, small enough to only require one pilot. All of a sudden, the pair are alerted to the arrival of the Pan-Pacific Defense Corps – the paramilitary force in charge of the Jaegir programme – and quickly make their getaway inside Amara’s Jaegir – affectionally nicknamed Scrapper. The pair show off their collective skills and knowledge as they first escape the PPDC, then manage to outmanoeuvre a full sized Jaegir – well, for a bit anyway. The pair are eventually caught, and forced into the open where they are arrested and taken in. This isn’t the first time Jake has been caught out, and he is given a choice: go to prison, or return to the PPDC as an instructor, with Amara as his first recruit. With little choice, Jake accepts and is soon shipped back to the place he’s been trying to escape – the Hong Kong Shatterdome. Here, Jake reunites with his old classmate and former co-pilot Nate Lambert (Scott Eastwood), a square-jawed by-the-book hero type that seems to infuriate Jake at every step. Amara, meanwhile, is introduced to her fellow cadets Suresh (Karan Brar), Jinhai (Wesley Wong), Viktoria (Ivanna Sakhno), Ryoichi (Mackenyu), Meilin (Lily Ji), Renata (Shyrley Rodriguez), Tahima (Rahart Adams) and Ilya (Levi Meaden). You get all that? You’ll be tested later. Since the end of the war, it turns out that Shao Corporation, a private organisation, is developing a Jaegir-like drone programme that will supersede the need for Jaegirs, or their pilots. 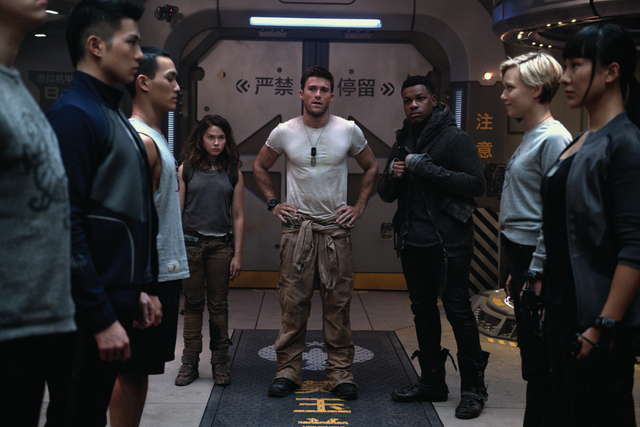 Headed by Liwen Shao (Jing Tian), with the support of former PPDC scientist, Dr Newt Geiszler (Charlie Day), the proposal is put to the Jaegir pilots to their mutual disgust. Dr Hermann Gottlieb (Burn Gorman), Newt’s former partner-in-crime is equally disgusted with the idea, however the final word won’t be made until the PPDC summit due to take place in Sydney. Jake is convinced by his adoptive sister, and now PPDC General Secretary Mako Mori (Rinko Kikuchi), to suit up once more with his former co-pilot Nate to stand as honour guard to the summit in his – and his father’s – Jaegir, Gypsy Danger. And that’s when things go wrong. The summit is attacked, out of the blue, by a rogue Jaegir, known later as Obsidian Fury. Unprepared for the attack, Sydney is slow to defend itself, with Mako killed in the attack. With no one left to refuse the proposal, and in the wake of Gypsy’s devastating loss against a random attacker, there is little to stop the Shao Corporation from introducing the new drones to the world at large. But who was behind Obsidian Fury’s attack? What were they trying to achieve, and will the Jaegir pilots be able to react in time to the new threat that is growing around them? Will Jake be able to live up to his late father’s expectations, and when will we get to see the cadets in action after the film took so long to introduce them all? One thing’s for sure, you’re in for some extremely obnoxious sound design and some wonderful action that would doubtless make for literally the best video game ever. There isn’t much more I can say without spoiling things for you. The film, like its predecessor, does have the nasty habit of flipping between huge bouts of giant-on-giant melee combat, to two people standing about and having a bit of a chat. Unfortunately this seems unavoidable in telling the story that Pacific Rim is trying so hard to tell. 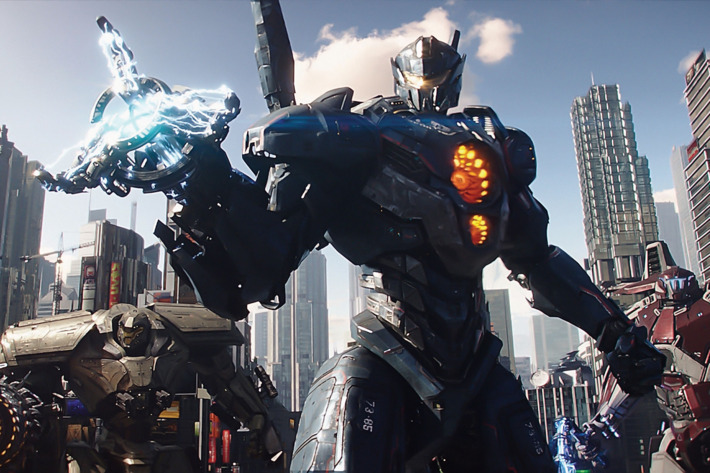 In many ways, Pacific Rim: Uprising feels like Independence Day: Resurgence (2016). In that it is a fairly pointless sequel that drops its pretence of emotion and character for big, dumb action and oddly placed humour. Come to think of it, they also share a pointless subheading and a subplot where a young black man struggles under the weight of his dead dad’s reputation and heroism. Still, what Pacific Rim: Umbilical Cord loses in soul, it tries hard to make up for in humour. Not that this is a bad thing, indeed the man to my right in the cinema was having a whale of a time. There was one bit that really worked for me, and I’m only disappointed there wasn’t more weirdness to the plot. If you’ve seen the film, you’ll know what I’m talking about. That bit. You know. When Dr Newt comes home to his off-screen wife, only to make a major plot reveal in literally the stupidest way possible – and to the the best music choice ever. Seriously. I laughed myself moist at this scene. It’s worth the admission price alone. Well, that and Lorne Balfe’s outstanding industrial-orchestral soundtrack. It should be noted too, that John Boyega makes this film watchable. He absolutely steals every scene he’s in, and while Jake’s rebellious nature seems to taper off into the background far too quickly for my liking, his charisma on screen doesn’t let up. By the end, I found myself rooting for him – despite the story around him feeling more and more like a Saturday morning kid’s show, complete with goofy antics and far-too-witty dialogue. It’s no wonder that Director DeKnight hails mostly from television. I can absolutely see this working as a, albeit very expensive, SyFy series. In short, then. Bit silly, bit stupid, mostly just fun. Although I’m still not sure who exactly was doing the uprising.